I’d left a glaze kiln cooling when I jetted off for Devon last week, here are a couple of the things that came out of it. 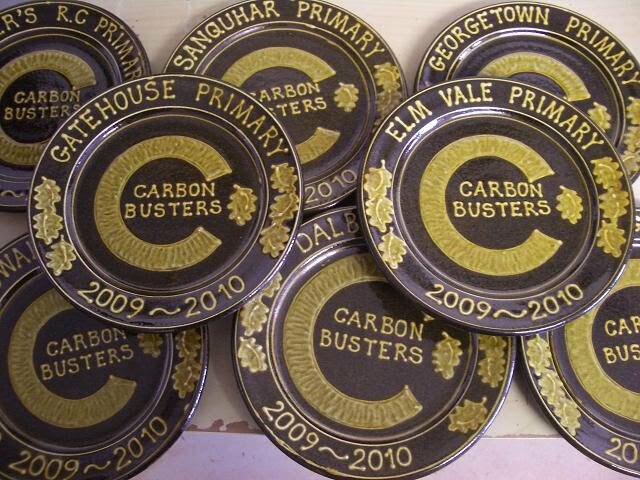 The plates above are for the Carbon Busters schools project which is run by the Crichton Carbon Centre in Dumfries. This is the second year I have made their prizes, it makes me feel quite chuffed looking at them because they don’t need them until June and for once in my little life I am super organised. I will be very pleased come June no doubt that I’m not having to squeeze them in around whatever else will be happening at the time. 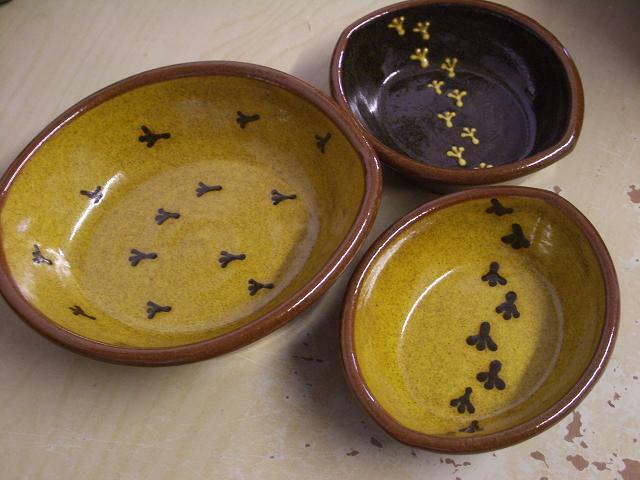 Some of the wee oval dishes I had made a couple of weeks ago. Maybe you would like some of these for the shop Christine. Speaking of which I will bring some over next week but I had banked from my mind when I spoke to Christine earlier today that I will be away in London until wednesday. How can I have forgotten that I come home from Perthshire on sunday evening and leave for London on monday morning? I am going to the launch of the Heritage Crafts Association, in my press capacity don’t you know (sounds good that doesn’t it). I’m going so that I can use it in my next article for the Craft&Design Magazine, and because it’s an interesting and exciting new project, and because it is at the V&A and I can get another scoot around there and because I get to see my potter friend Annabel and also my friend Elinor who works at the V&A now. 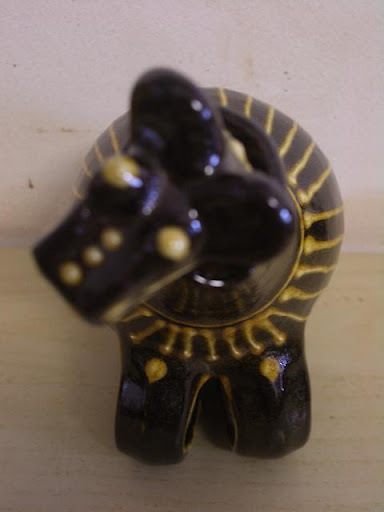 Another wee oil pourer beastie out of the kiln. 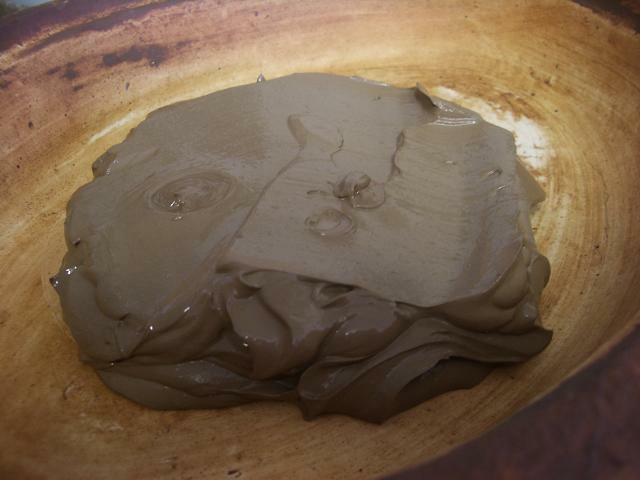 This is some of the clay that I got from the beach over Christmas, I have finally got it washed and sieved. It feels nice but I haven’t thrown anything with it yet. I left a lump with Doug last week too, there’s only about enough for an egg cup though. For those of you that haven’t managed to get a hold of the magazine, not sure if it’s available over the water for all you US bloggers, here is a copy of it. I hope Craft&Design magazine don’t mind, the issue has been out over a month now so it’s not brand new anymore. So away in the morning to Kindrogan for the Scottish Potters conference, we are having the following three invited demonstrators to show us their skills and share their passions for the weekend. Bridget Drakeford, Nicholas Marsh and as I mentioned in a previous post, Paul Young. Along with that we have a lady coming to demonstrate a tea ceremony, Paul Young giving us a chat about his India residency, a ceilidh on the saturday evening with the theme “Eastern Promise” which I tried and tried to come up with something clever and funny for but failed on the inspiration and the time front and have opted for an Indian style top instead, poor effort but it’s better than nothing. The wee film is the master movers Mr D Fitch and Mr P Jessop trying to shift Paul’s wheel from the old workshop to the new. How could I not stand and laugh while all that was going on? 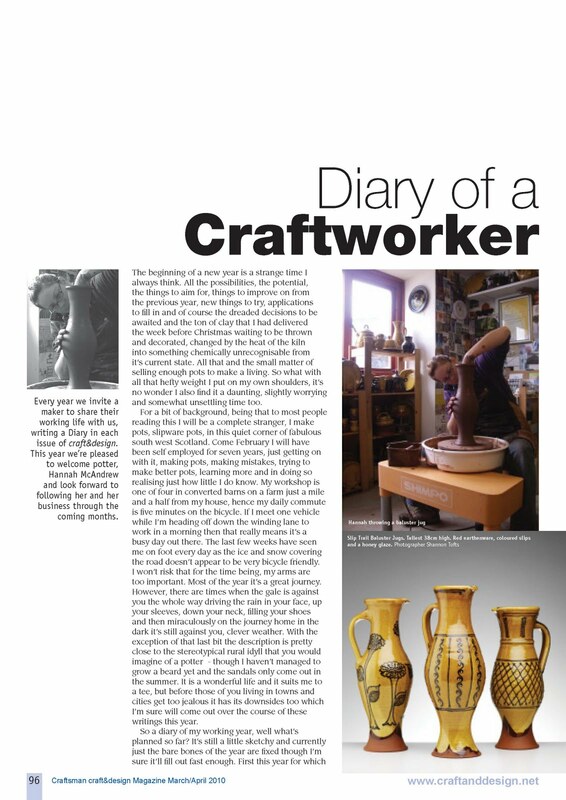 This entry was posted in Annabel Faraday, Bridget Drakeford, Craft and Design Magazine, Doug Fitch, Nicholas Marsh, Paul Jessop, Paul Young, Scottish Potters association, Victoria and Albert Museum. Bookmark the permalink. Too funny! Brought back a bad memory of a dryer that wouldnt fit down to the basement….a reciprocating saw was the answer… I sure love the ovals, a little decoration can go a long way too huh! Awesome plates! How nice of you to do them. They are amazing and should be great prizes eagerly sought after! The movie was great! Simple things can be so amusing. yep i like the way you were particularly helpful H so how many issues of the mag are you writing for it's a great idea..couldn't read the 2nd page though a bit too small even with the blown up version..
Those damn treadle wheels are a pain to move. Glad you got that on film! Too funny for sure. Thank goodness no pots were broken. I thought potters were practical and did things like clearing a pathway and measuring gaps! !By the way if you DO take one apart it will fit in the boot of a 2CV….! !Love the "tracks in the snow" dishes. That film looked strangely familiar….! Enjoy (all) the trips, looking forward to lots to read about when you come back. Hey, good job you got those plates done early. Classic. Tape measure and clearing a path could of helped. What makes me laugh the most is the thought of Dougie being our technician at college – what hope did we have! 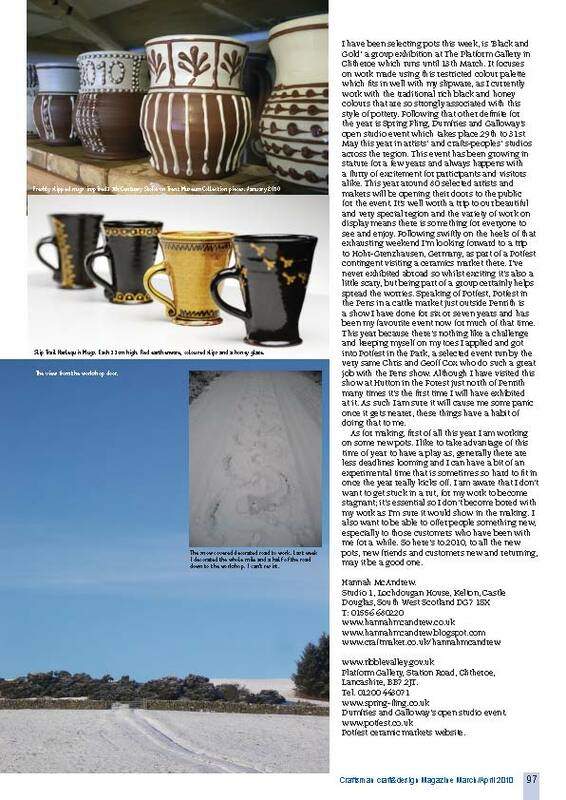 Oh my god !and it was all going so well up until then.Great pots and a great article, you certainly are putting it about a bit these days! I mean that in the nicest possible sense. even though you posted that video, we could have got two monkeys in to do a better job.! !